HUMBOLDT, Saskatchewan (AP) — The people of this small town grieved at their hockey arena Sunday, laying flowers and jerseys in a makeshift memorial at the entrance and later gathering inside to mourn the deaths of 15 people when a semi-trailer slammed into the bus carrying the local youth hockey team. 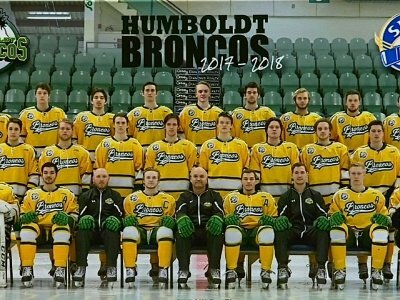 The 14 others on the bus were injured, some critically, in Friday night’s collision, which has Canada, its national sport and the hockey-obsessed town of Humboldt reeling. Among the dead are Broncos head coach Darcy Haugan, team captain Logan Schatz and radio announcer Tyler Bieber. Team President Kevin Garinger choked back tears as he read out the names of the 15 dead. People embraced each other, crying. Boxes of Kleenex were passed down rows. Behind them, flowers ringed the team logo at center ice. In front of them, there were pictures of the dead and injured. Humboldt pastor Sean Brandow, the team chaplain, said he was on his way to the Broncos game Friday and arrived at the scene right after the collision. He described hearing the cries and holding the hand of a lifeless body. “I walked up and saw a scene I never want to see again, heard sounds I never want to hear again,” Brandow said. Nick Shumlanski, an injured player who was released from the hospital, attended the vigil wearing his white, green and yellow team jersey, with a bruise under his left eye. While most of the players were from elsewhere in western Canada, they were put up by families in the small town of Humboldt. Billeting families are a large part of junior hockey, with players spending years with host families. Dennis Locke, his wife and three young children came to the arena to hang posters of forward Jaxon Joseph, who was the son of former NHL player Chris Joseph. The Locke family hosted Joseph and treated him like a son. His wife wiped away tears from swollen eyes. Forwards Jacob Leicht, Logan Hunter and Conner Lukan and defensemen Stephen Wack, Adam Herold, Logan Boulet and Xavier Labelle were also among the dead, according to family members and others. Assistant coach Mark Cross, bus driver Glen Doerksen and stats keeper Brody Hinz, who was 18, were also killed. Herold, who would have turned 17 Thursday, played for the Regina Pat Canadians hockey team until just weeks ago, but was sent to join the Broncos for their playoff round when the Pat Canadians’ season wrapped up, said John Smith, the Pat Canadians’ manager. Norman Mattock, a longtime season ticket holder, said his neighbor housed player Morgan Gobeil. The defenseman was severely injured and remains in serious but stable condition, Mattock said. He said players become part of the community fabric, doing volunteer work or serving in restaurants. Three players who stayed with the same family all died in the crash, he added. “They lost them all,” Mattock said. The Broncos were a close-knit team who dyed their hair blond for the playoffs. The bus was driving the team to a crucial playoff game Friday against the Nipawin Hawks. Garinger said the team will continue next year and won’t disband. The home page of the team’s website was replaced with a silhouette of a man praying beneath the Broncos’ logo of a mustang. The pews were full Sunday at St. Augustine Roman Catholic Church in Humboldt, where the Rev. Joseph Salish told parishioners that if they felt like crying, they should cry. Between Masses, streams of people — many of them red-eyed from crying — hugged each other. MacLEAN said the community comes together at the arena on game nights that draw 800 to 1,000 people to the stands. “It’s an energy that spreads through the town with road signs saying ‘Game tonight,’ tickets for sale everywhere,” he said. As is the case with small town hockey across Canada, he said, the arena is not just a recreation facility, but a focus of community life with the hockey team at its center. With players staying with local families, working in city businesses and attending local schools, the tragedy touches every corner of Humboldt, MacLEAN said. Canadian police said the truck driver, who was not hurt, was initially detained but later released and provided with mental health assistance. Royal Canadian Mounted Police Assistant Commissioner Curtis Zablocki said it was too early to state a cause for the crash. Police have not said whether or not the driver was impaired. Photographs of the wreckage showed the twisted trailer with most of its wheels in the air and the bus on its side with a portion destroyed. The force of the crash sent both vehicles into the ditch at the northwest corner of the intersection. Police said a lot of issues remained to be investigated in the bus crash, including weather conditions at the time and any mechanical issues with the vehicles. Associated Press writer Jeremy Hainsworth reported this story in Humboldt and AP writer Rob Gillies reported from Toronto.